Where should you be on Saturday, October 13, 2018? 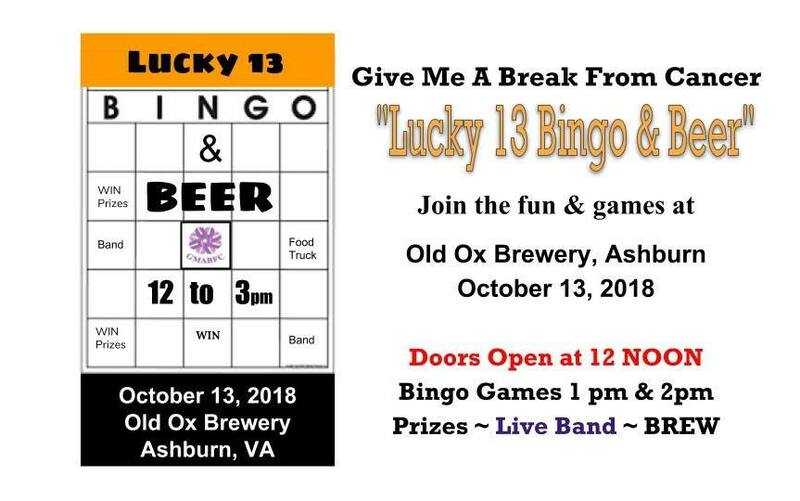 No question…you should be having fun with us from12pm to 3pm at the Old Ox Brewery in Ashburn, VA. Stop by for some cold brew, food, and live music by the “free-range, locally-sourced, hand-crafted” cover band Mandatory Recess. Also test your luck to win prizes in our “Lucky 13 Bingo” games. All this to help raise funds to send young adult cancer patients on much-deserved breaks. $30 Entry Ticket includes one (1) cold beer, bar snacks, live music, one (1) entry for door prize, and bingo cards. Sponsorships also available.